Looking for a delicious no knead bread? 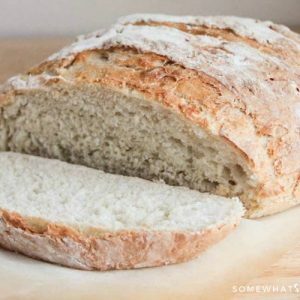 This Crusty Artisan Bread Recipe comes together quick and easy! Mix in salt and flour, stirring until there are no dry patches. The dough will be very soft and not like a typical bread dough. Cover with a kitchen towel and let rise in a warm place for 2 hours. After rising, divide dough into two pieces and shape each into a round ball. Place each ball of dough on a piece of parchment paper, and let rest 40 minutes. During the second rise, preheat oven to 450. Place a baking stone or overturned baking sheet on the upper oven rack, and a broiler pan or metal cake pan on the lower shelf. Heat the baking stone at least 20 minutes before baking. When the dough is ready to bake, dust it with flour and cut three deep slashes across the top. Slide the dough on the parchment paper onto the baking stone using a pizza peel (or a thin cutting board). Pour a cup of water into the broiler pan/cake pan and shut the oven door quickly. Bake until golden brown, 24-28 minutes.